Remember the panic selling in February? It all seems silly now—the economy is surging, companies are beating high earnings expectations and American consumers are more confident than ever. And the stock market is finally catching on—the S&P 500 is up a solid 5.9% in 2018, and the momentum for stocks to go higher is clearly there. The good news? You can get into this raging bull market and still see a lot of upside. Since the market is still a sliver off its all-time high (which it hit in January, before the plunge), we are nowhere near a top—especially since earnings have soared since then. Of course, you can buy in with a “dumb” index fund and wait for the market to rise. But you’re better off offsetting some of the market’s latest rise by purchasing those same stocks at a big discount. I know that sounds like a pipe dream, but you can do it easily through a group of overlooked investments called closed-end funds (CEFs). Right now there are 3 CEFs that invest in the same mid-cap and large-cap stocks that are driving this booming stock market. Plus they pay dividends up to 5.8%, or over triple the S&P 500’s measly 1.8% payout. And that’s not even the best part. CEFs trade at a price set on the open market, but these prices often diverge from the liquidation value of CEFs’ portfolios (known as the net asset value, or NAV) for one simple reason: CEFs cannot issue new shares to new shareholders. This means that if demand for a particular CEF is too low, regardless of the CEF’s fundamental performance, the market price will be less than the CEF would be worth if it were liquidated tomorrow. 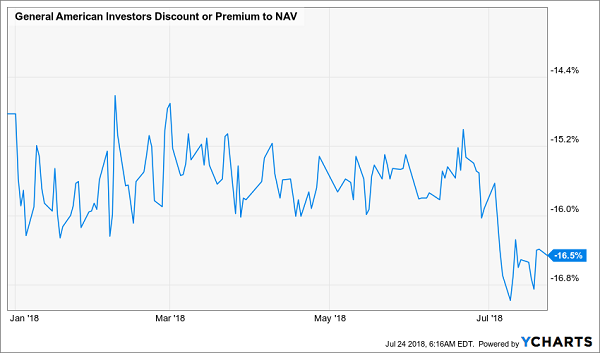 Today’s bigger discounts are handing us contrarians a golden opportunity: the market has been selling off shares in CEFs, but the CEFs’ actual portfolio value hasn’t gone down by as much. In some cases (approximately 44% of all CEFs), their portfolios’ values have actually gone up since the start of the year. So our next step is simple: target the funds with the strongest discounts and the most promise, thanks to their portfolio makeup. Our first standout CEF is the Dividend and Income Fund (DNI), a 4.8%-yielding fund whose value-driven approach has caused it to struggle, but that’s in the past. So if you’re kicking yourself for missing out on the big rally in tech stocks we’ve seen in the last couple years, this is your chance to rewrite history. Grab DNI and its trove of tech winners now, while you can still get them for 22% off. The Eagle Growth & Income Opportunities Fund (EGIF) is another fund that, like DNI, has undergone a shift that the market has missed. EGIF is a small ($134 million in assets under management) fund that has underperformed, largely due to its focus on energy stocks and MLPs such as Energy Transfer Partners (ETP) and Enterprise Products Partners (EPD). One other thing about EGIF: its generous 5.8% dividend means you’ll be collecting a nice income stream while you wait for the fund’s market price to rise and start chipping away at that discount, bringing the fund back to the premium pricing it enjoyed as little as three years ago. The third fund I want you to consider is a strong CEF that has been ignored for the silliest reason imaginable: its yield is low. While the average CEF yields over 5% and many yield as much as 10%, the General American Investors Fund (GAM) yields just 1.4%, based on its last two payouts. But here’s the thing about GAM: it strives for top total returns and will lower its dividend when it thinks the market is ready to pop. That way it can reinvest that cash to boost shareholders’ total returns. This is why GAM’s dividend was triple its current level in 2016. 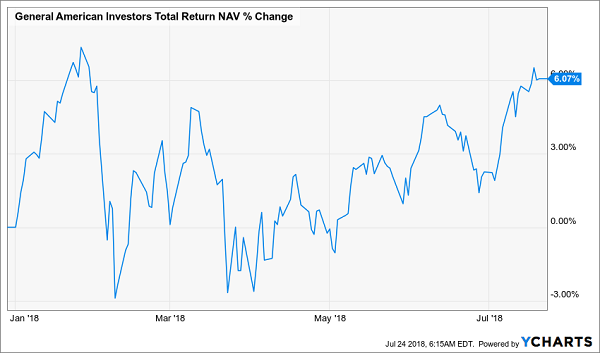 After making profits in last year’s bull market, the fund handed those profits to investors, and this year it’s keeping its gains to reinvest and boost investors’ profits even more. Is this prudent dividend policy working? Absolutely. 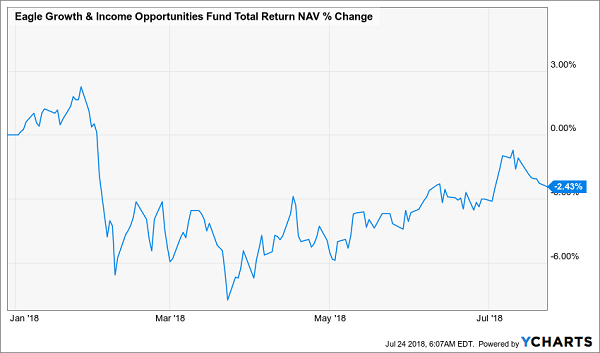 With a 6% gain on its NAV, GAM is one of the top-performing CEFs of 2018 (there are only 10 funds beating it on a total NAV return basis). It’s also the top equity-only CEF on the year. But the market is actually punishing this fund’s sterling performance. 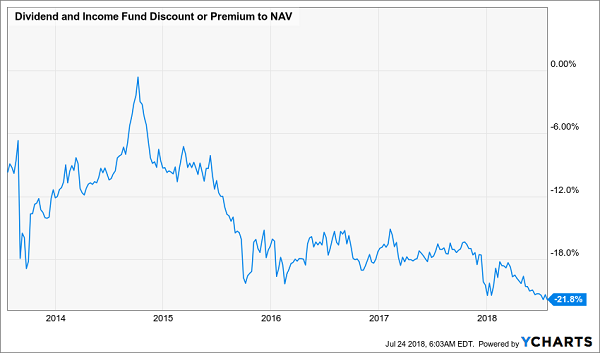 Think about that for a moment: even though management has put up the best record of any CEF that invests only in stocks, the fund’s discount has actually been getting bigger! One day the market will realize the mistake it’s made with GAM, as investors see the fund’s NAV increase and its price fail to rise to match. And as they buy in, driving its market price back up, anyone who bought ahead of time will be lined up for gains. But don’t just stop at the upside offered by GAM. Because there are 4 other funds that give you upside just as big as this off-the-radar pick offers, PLUS a 7.1% average dividend, too. 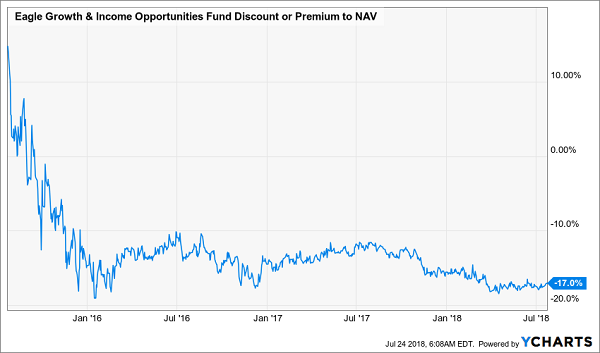 In fact, the 4 funds I’m about to show you are trading at such outrageous discounts to NAV that I expect them to pop a full 20% (on a price basis) in the next 12 months AND you’ll be collecting that fat 7.1% dividend stream the whole time! I recently rolled out these 4 bargain dividend payers to members of my CEF Insider service. And I want to share full details on all 4 of them with you right now. PLUS, each of these “fantastic 4” is run by a proven Wall Street vet who’s shown their chops in good markets and bad. These 4 fund picks are perfect for the tariff- and interest rate–obsessed times we live in. Their 7.1% average dividend is attractive enough on its own, so you can consider their 20%+ price upside a nice “finder’s fee” for getting in now! Don’t miss this unique opportunity. CLICK HERE and I’ll give you everything I have on these 4 funds: names, ticker symbols, buy-under prices, my complete analysis of management and much more.